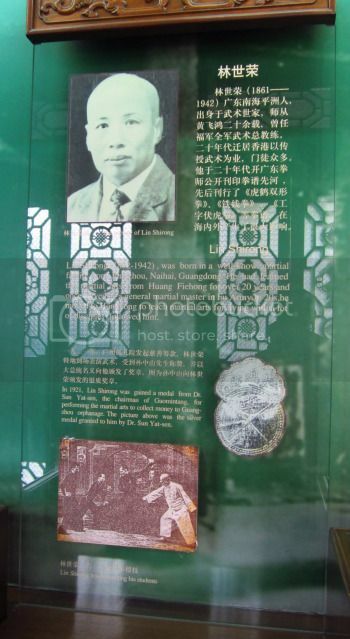 In the old site, there was a thread on the Huang Fei Hong 黄飞鸿 Memorial Hall I thought I should reproduce it here. 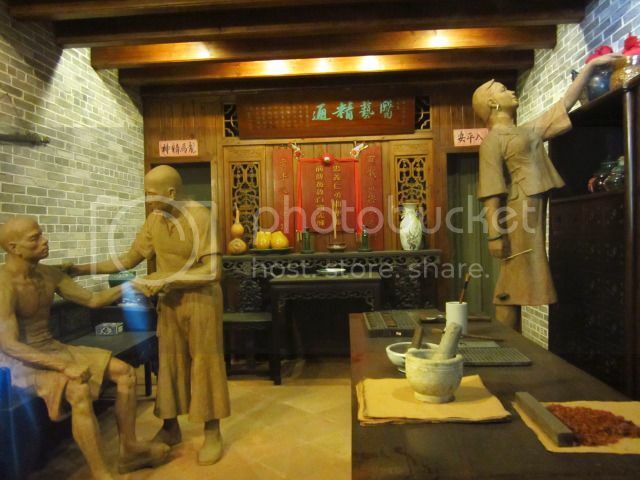 There is a temple in the city of Foshan 佛山, called Zu Miao 祖庙 - Ancestral Temple. 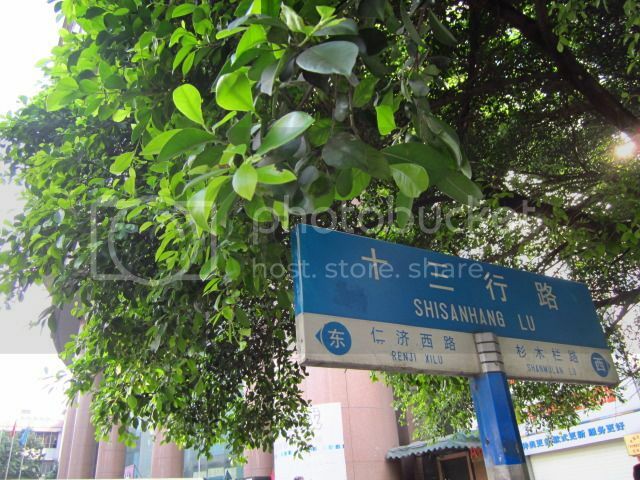 Foshan is near Guangzhou 广州, in the Province of Guangdong 广东 in China. 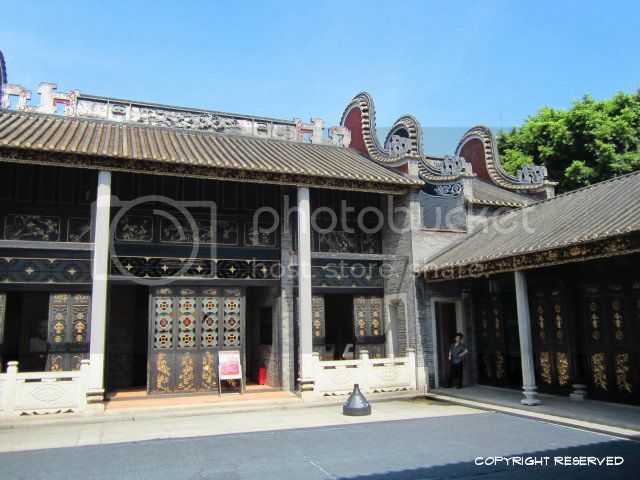 The Ancestral Temple in Foshan is home to two Memorial Halls. 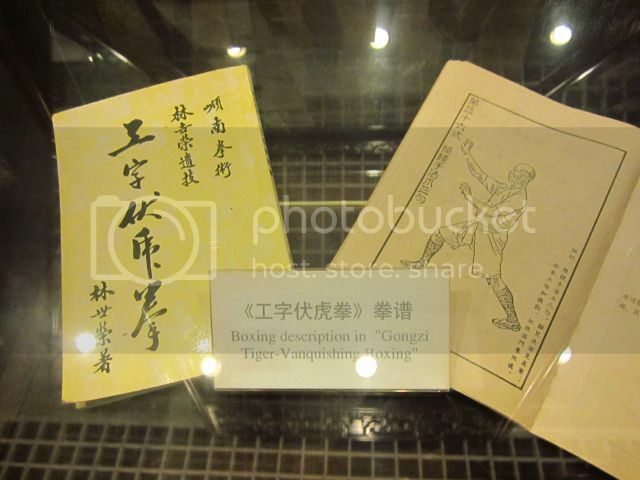 One is dedicated to Ye Wen 叶问, of Wing Chun 永春 fame. The other Memorial Hall is dedicated to Huang Fei Hong 黄飞鸿 (Wong Fei Hong) - July 9, 1847 – March 25, 1924 (according to wiki). 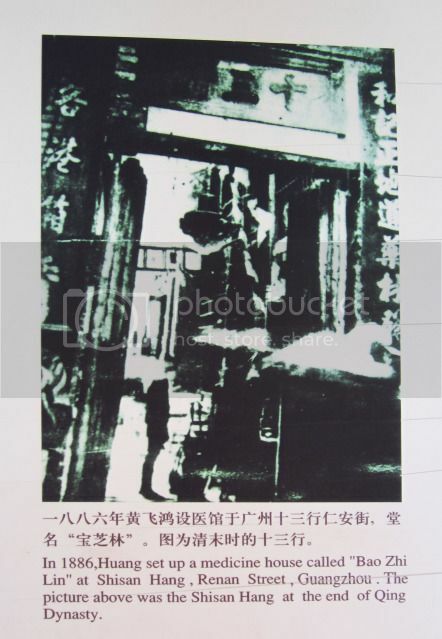 This is the real photo of Huang Fei Hong, which was provided by his fourth wife, Mdm Mo. This is supposed to be the only photo of Huang Fei Hong in existence today. 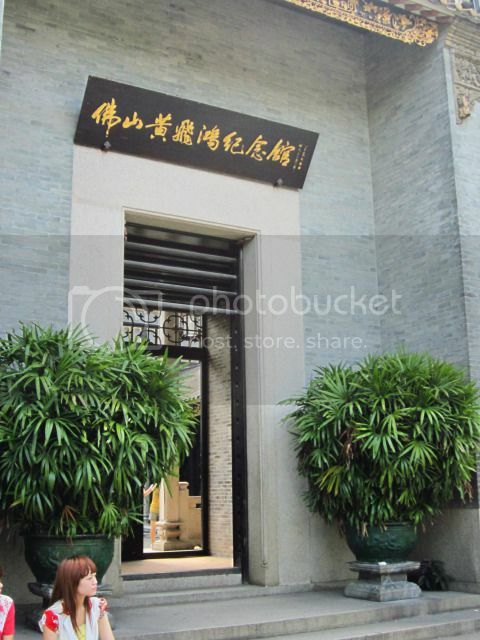 This is the entrance to the Huang Fei Hong Memorial Hall. The Memorial Hall to Huang Fei Hong was initiated by Huang's fourth wife, Mdm Mo GuiLan 莫桂兰. 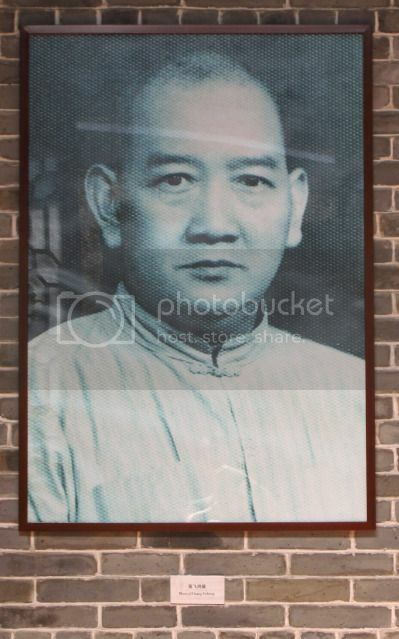 Foshan was appropriate as the site of the Memorial Hall because Huang Fei Hong was born in Foshan. He later moved to Guangzhou and started his gymnasium there. This is the photo of Mdm Mo. 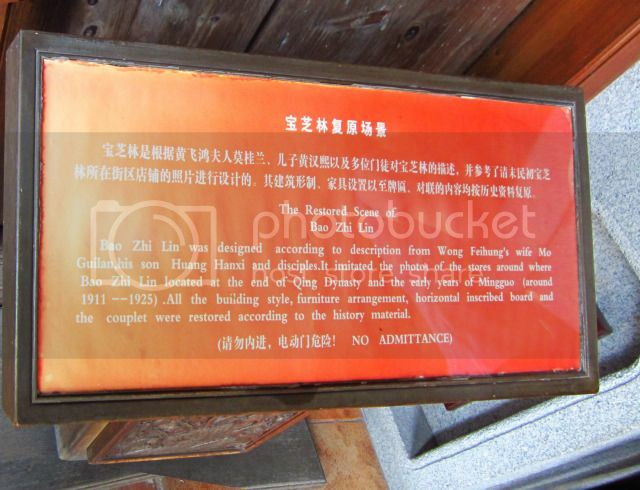 Huang Fei Hong was not a polygamist, his kept re-marrying after the death of his first, second and third wife. They died from illnesses. 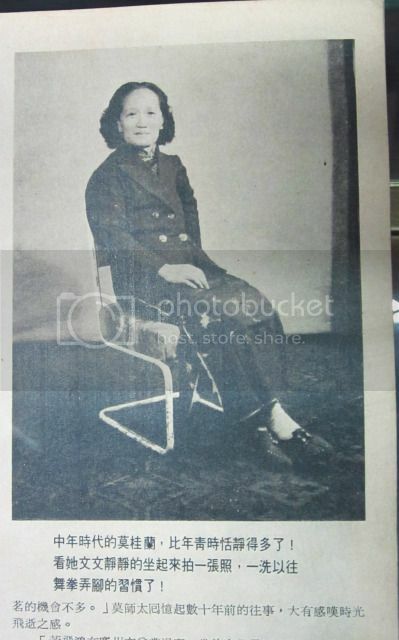 Huang Fei Hong was survived by this fourth and final wife, Mdm Mok. According to an interview by a newspaper with Mdm Mok, it was some sort of an arranged marriage. Mdm. Mok was brought up by her uncle and aunt (quite common in those days), who happen to be friends of Huang. 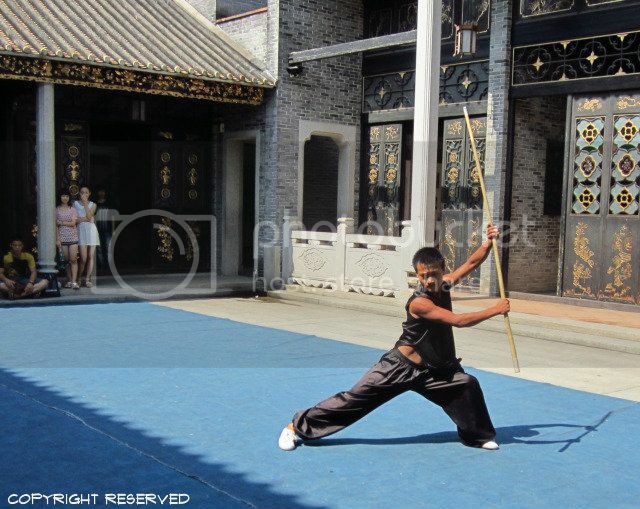 Mdm Mok was a martial arts practitioner as well. 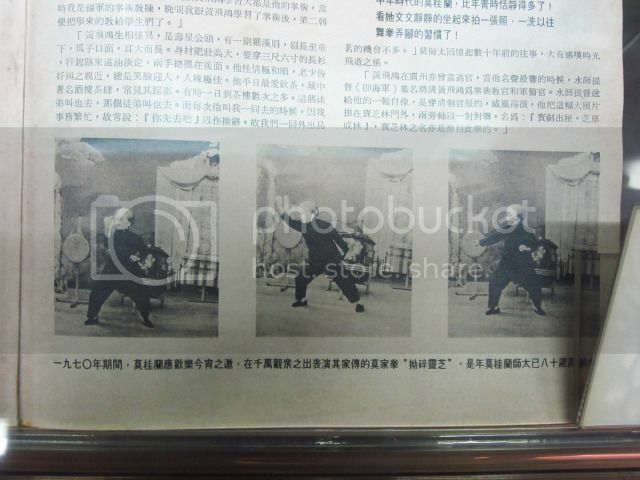 This is a magazine clipping for showing Mdm Mok performing her moves. As a by the by, the usual manner of referring to a married woman in the old days is to describe her as Mrs X. If need be, she would be referred to as Mdm Y. Her given name is seldom/hardly used in public - it is deemed personal. It would be used only by her family members and close friends. Until today, at the funeral of a married woman, the notice of unfortunate event runs something along the lines of "... Mdm Y from the house of X..." where Y is the woman's family name and X is the husband's family name. I liked the film, "Iron Monkey" which was mainly about Huang Fei Hong's father, Huang QiYing. However, the story also had a few scenes of a very young Huang Fei Hong. The character of the young Huang Fei Hong was played by a girl! 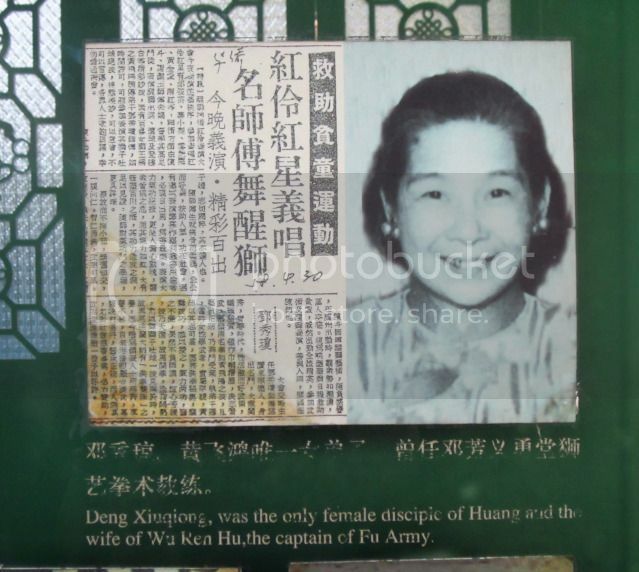 On the topic of females, Huang Fei Hong had a female disciple - one only, according to the display in the Memorial Hall. Another famous disciple of Huang Fei Hong was Lin Shi Rong 林世荣. He left for Hong Kong. exists, but the places have changed beyond recognition as well in the intervening years. 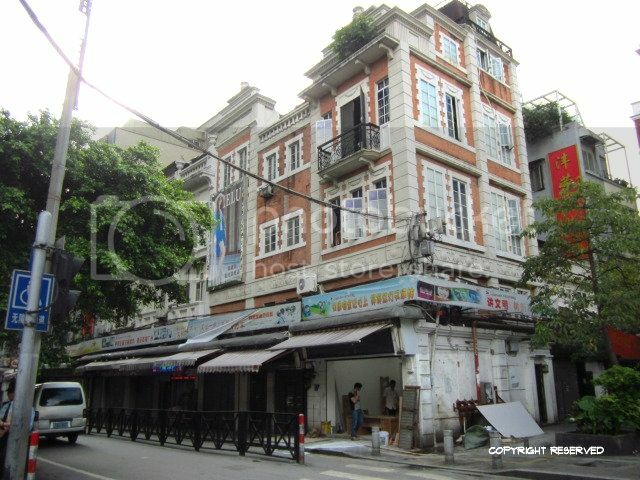 The photo below states that the first Bao Zhi Lin in Shisan Hang, off Renan Street, Guangzhou. This is the present day Shisan Hang. This is where I believe Huang Fei Hong's famous Bao Zhi Lin used to be, according to the address I found in the Huang Fei hong Memorial Hall. ... based on Mdm Mo's recollection. 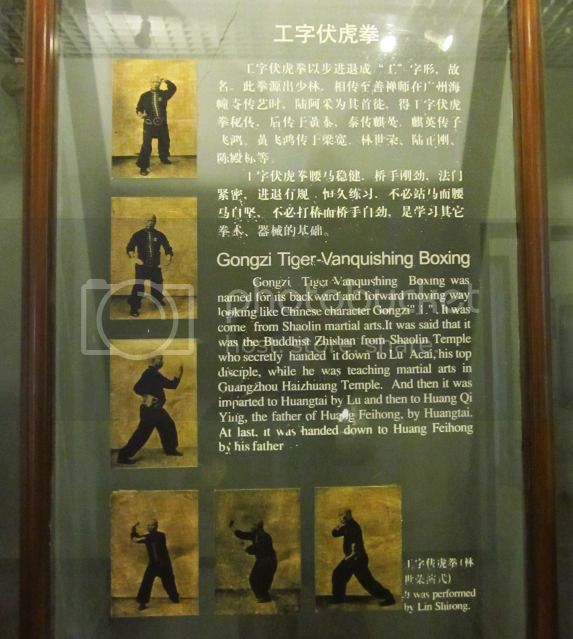 Besides being famous for his Bao Zhi Lin medical hall, Huang Fei Hong was also known for his martial arts prowess. 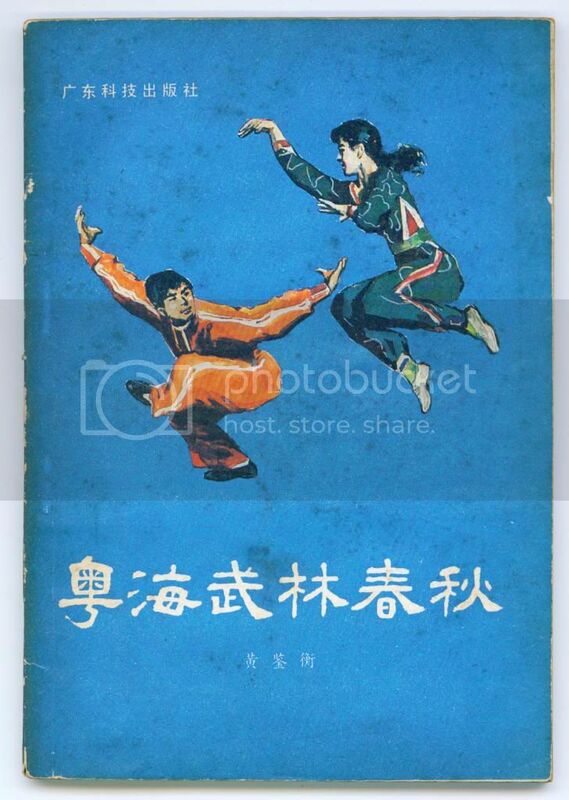 I presume his famous "Invisible Kicks" has now been lost, but his disciple, Lin Shi Rong, 林世荣, had a disciple Zhu Yu Zhai 朱愚斋 who published three books - I believe in Hong Kong, not Guangzhou. 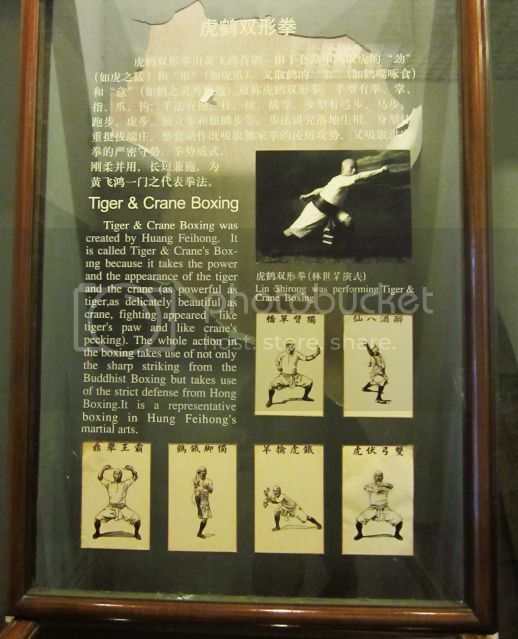 According to the Huang Fei Hong Memorial Hall, the Tiger-Crane Style was created by Huang Fei Hong. I have always thought that it was created by Hong Xi Guan 洪熙官. 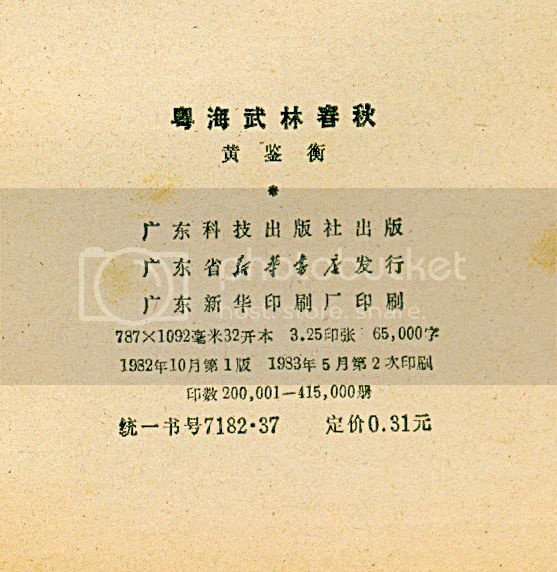 This Hong Xi Guan version was portrayed in the Shaw Brother's production called "Executioners from Shaolin，" 洪熙官. The third book was the Iron Wire Fist. 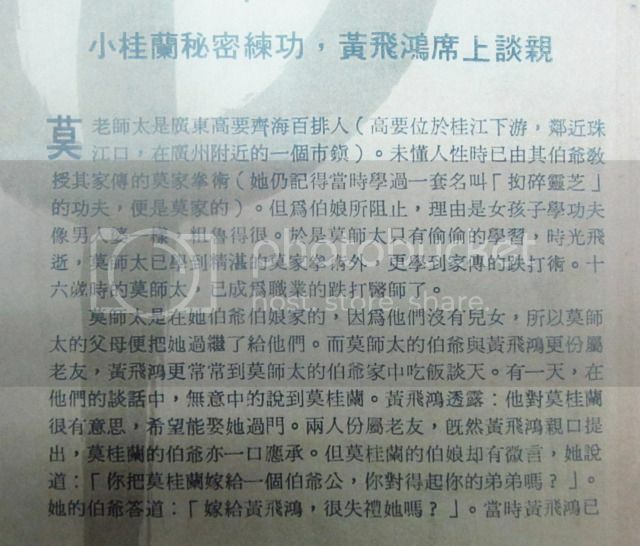 ... snipped... his disciple, Lin Shi Rong, 林世荣, had a disciple Zhu Yu Zhai 朱愚斋 who published three books - I believe in Hong Kong, not Guangzhou. Looking for information in Lin Shi Rong and his disciples, and events leading to his emigration to Hong Kong. I found this one. 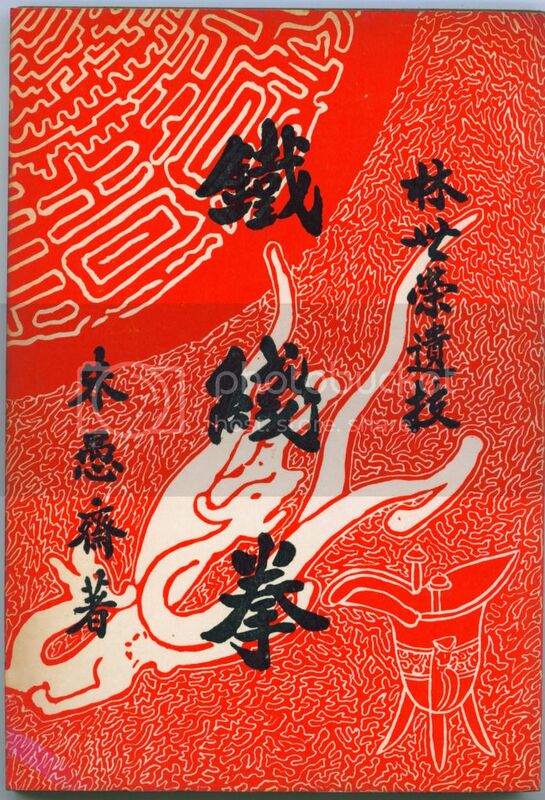 Roughly translated, the title means "Annals of Southern China Martial World"
The second edition, printed in 1983, cost a massive CNY0.31 ! The details of the publisher and author etc. is below. 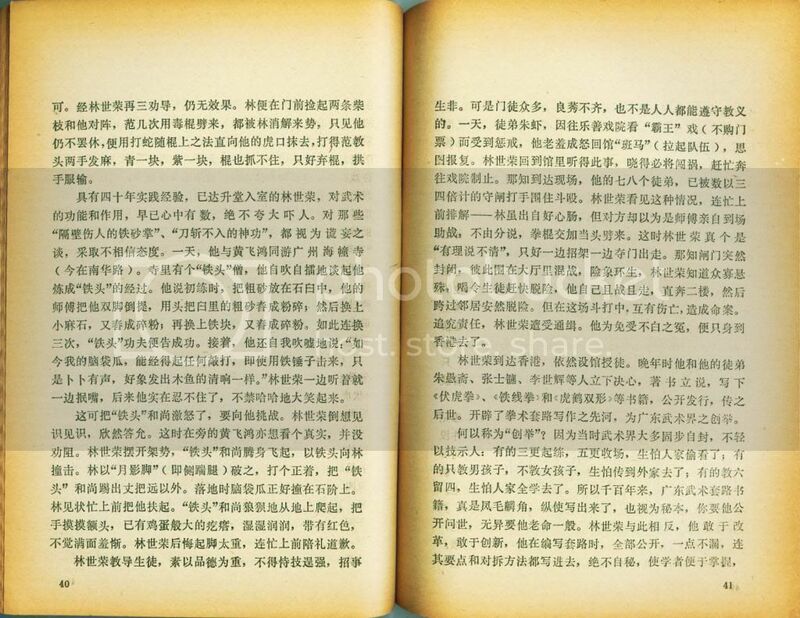 In these pages of the "Annals of Southern China Martial World" detailed the life of Lin Shi Rong - I believe by this time, Huang Fei Hong would have died. It does infer that Lin Shi Rong has his own gymnasium by this time. 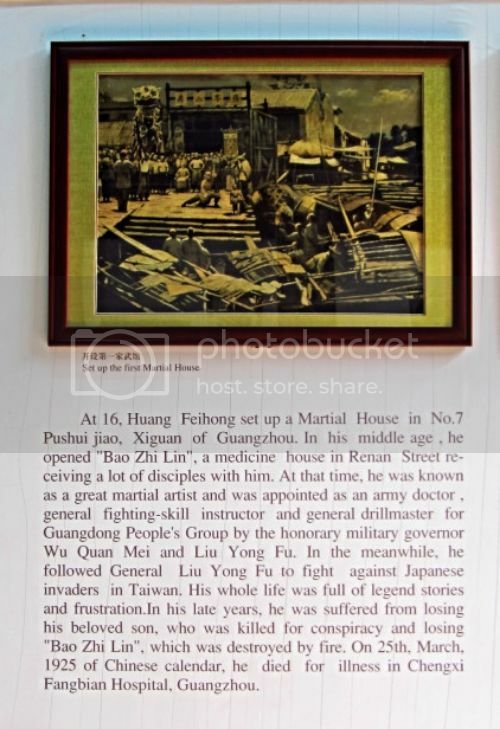 By this, I would gather that either Huang Fei Hong had given his consent to his disciple to start his own gymnasium, or that Lin Shi Rong opened his own gymnasium after Huang Fei Hong had passed on. 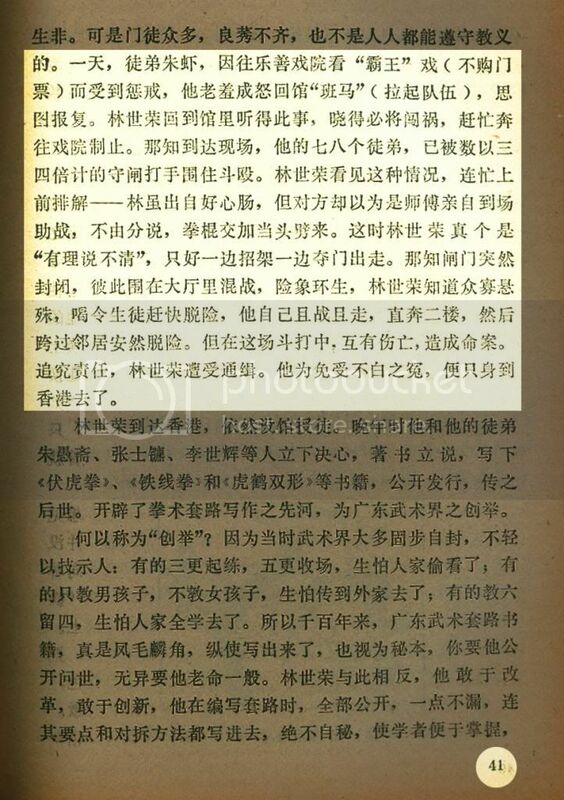 Page 41, highlighted here, detailed the events that lead Lin Shi Rong to leave (flee) Guangdong for Hong Kong. The long and short of it was that Lin Shi Rong's disciple caused trouble (disciple was in the wrong) leading to Lin Shi Rong's disciples (yes, plural) being surrounded and was in for a beating. Lin Shi Rong tried to save them but in the fight, quite a few people were badly injured and some died. Lin Shi Rong then practiced the 36th strategy from Sun Tzi's "Art of War" (flee) - and hot healed to Hong Kong with a few of his (surviving ?) disciples. Among them was Zhu Yu Zhai - who wrote the three aforementioned books. There is a write-up in this wiki link on Hung style skills. 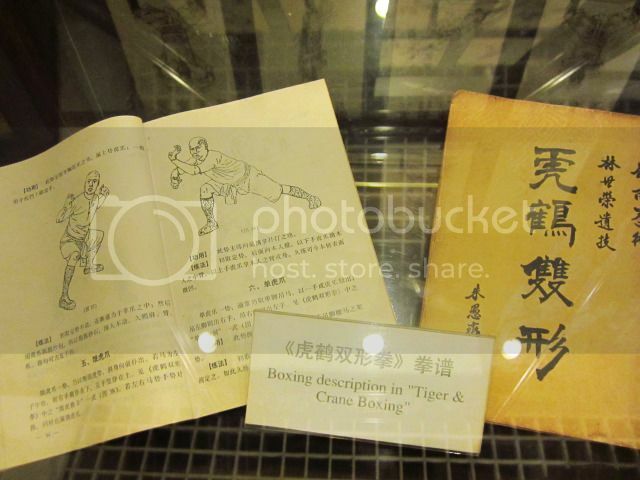 It includes mention of the Tiger and Crane, Iron Wire and Tiger Subduing styles. 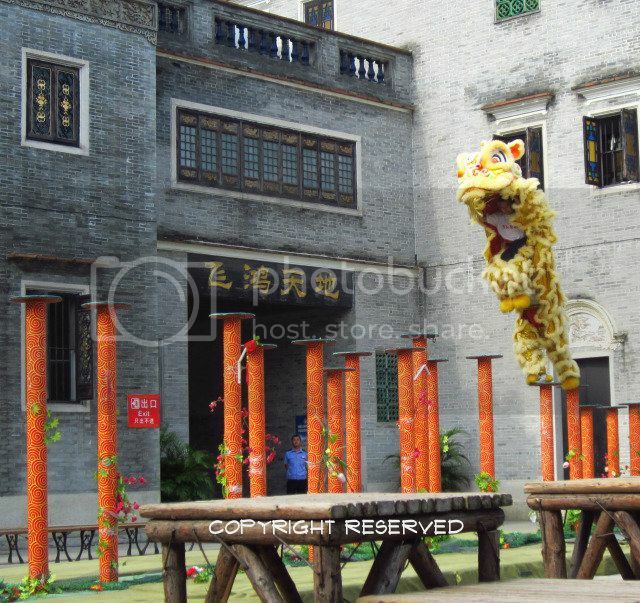 There now exists a Foshan Huang Fei Hong Lion Dance and Martial Arts school. I do not know who formed it, but I would bet Huang Fei Hong's wife, Mdm Mo, had her hand in its creation. 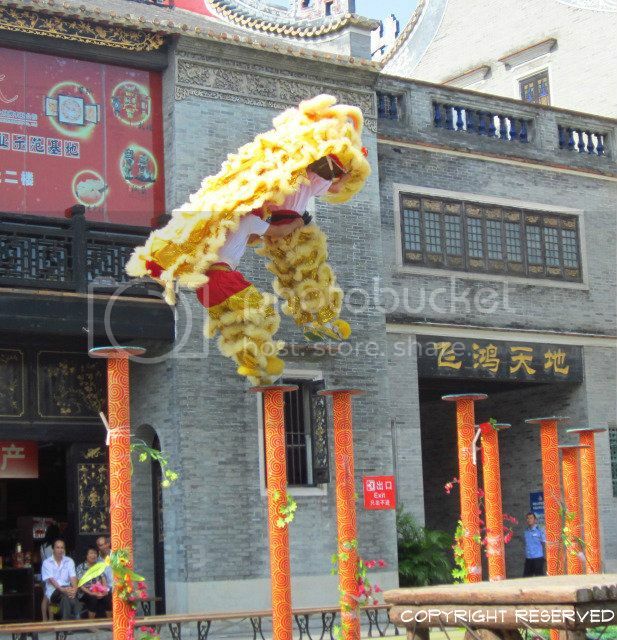 The Lion Dance and Martial Arts school have a few performances at the Huang Fei Hong Memorial Hall every day. The Lion Dancers perform outside the Memorial Hall while the martial arts practitioners perform in the courtyard inside the Memorial Hall. The martial arts practitioners perform first; and a few minutes later the Lion Dancers display their abilities outside the Memorial Hall. This the courtyard inside the Memorial Hall. 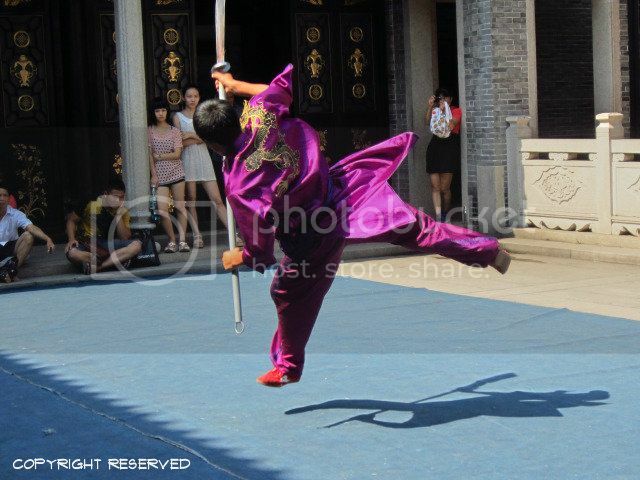 This person performed the long handled broad blade, I have heard it being called the big blade - da dao 大刀, door guarding blade ba men dao 把门刀 and guan dao 关刀. However, this is a performing broad blade, the blade was thin and flopped a bit too much for my liking. His performance was fine though. This practitioner performed the cudgel, which I liked. This young man performed the Iron Wire Fist, which I thought was done rather nicely. 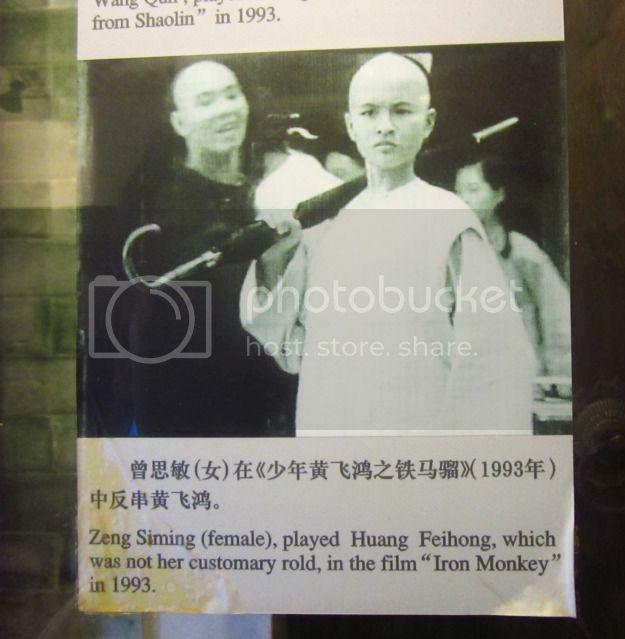 As a by the by, in the Stephen Chou film "Kung Fu Hustle", the tailor practiced The Iron Wire Fist. Another practitioner performed the Tiger-Crane Style. I could swear a few moves were missing, e.g. Hungry Crane Seeks Prawn 饿鹤寻虾 but to be fair, it is possible that I missed them because I was busy trying to take photos! Immediately outside the Huang Fei Hong Memorial Hall was piece of open land. At certain times of the day, about half an hour after the martial arts performance inside the Main Hall, there is a Lion Dance performance. 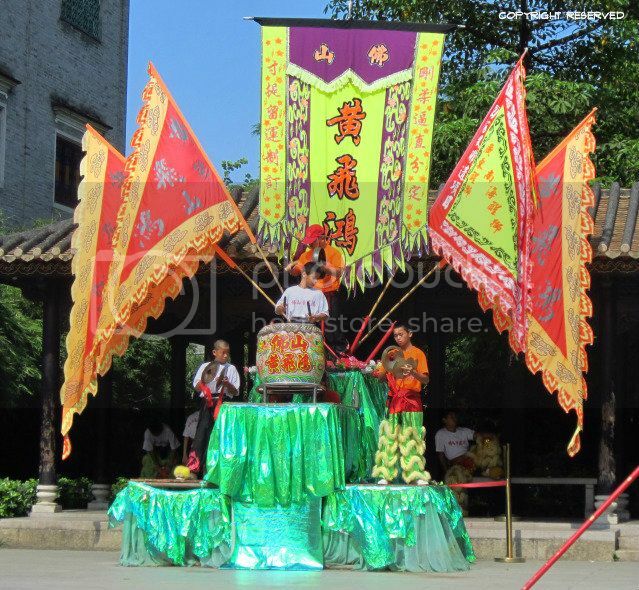 This is the drum and cymbal platform with flags bearing the name of the performing troupe. The Lion Dance performance was interesting and quite exciting.